Click here for an overview of our research theme. 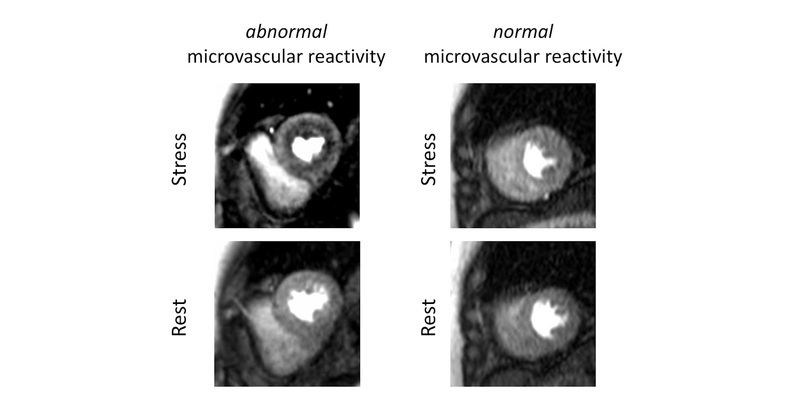 KEYWORDS: cardiovascular magnetic resonance imaging, coronary microvascular dysfunction, microcirculation, machine learning for accelerated medical imaging, image reconstruction, computational imaging. Goal: This NIH-funded project aims to (i) overcome major technical challenges in non-ECG-gated cardiac perfusion MRI; (ii) establish a reliable approach for quantification of subendocardial perfusion reserve as a sensitive imaging marker for detection of microvascular disease in patients with "normal" coronary angiograms. Funding: NIH grant R00 HL124323-03 (2017 — ongoing). References: See our publications page. Goal: This project aims to develop the first machine-learning framework (using deep convolutional neural networks) for analysis of free-breathing cardiac perfusion MRI datasets without the need for motion correction, hence enabling a rapid and vendor-independent post-processing platform. Funding: NVIDIA academic GPU grant. Goal: The goal of this NIH career development project was to develop a quantitative high-resolution first-pass perfusion MRI method using radial sampling enabling acquisition of 3-6 myocardial slices without the need for ECG gating and free of the subendocardial dark-rim artifact. Funding: NIH grant K99 HL124323-01. Goal: The goal of this project was to study the effectiveness of high-resolution first-pass myocardial perfusion in a single-center trial of 44 patients with suspected coronary artery disease. Funding: Astellas Pharma U.S., Global Development (Investigator Initiated Trial #REGA-13G03). 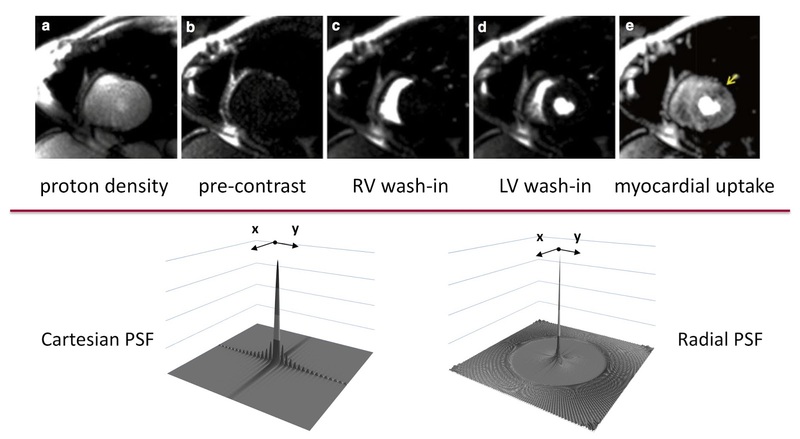 Goal: The goal of this project was to develop a novel ungated MRI method, validate it in a large animal model of obstructive coronary artery disease (CAD), and test it in patients with known CAD based on invasive angiograms. 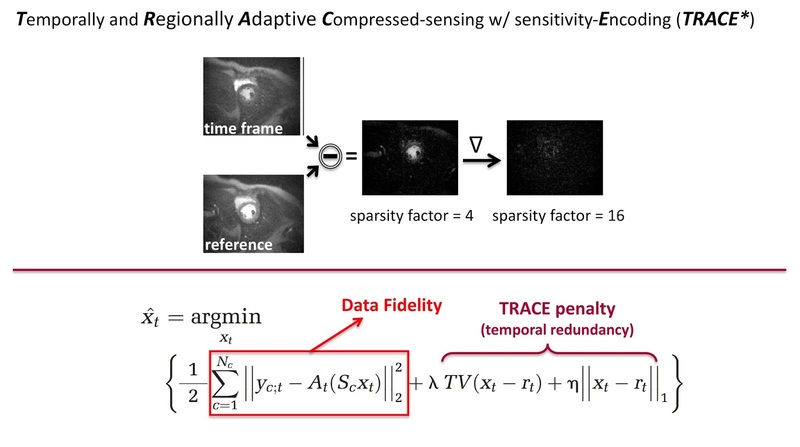 Goal: We developed a data-adaptive compressive image reconstruction scheme dubbed TRACE that enables high-resolution dynamic imaging of multiple slices simultaneously by exploiting temporally and regionally adaptive sparsity. The sparsifying transform changes dynamically for each time frame and is constructed based on a gradient operator using a sliding-window temporal average, i.e., a fully-encoded high-resolution "reference" image. Funding: AHA Scientist Development Award 14-SDG-20480123. Goal: This completed project aimed to develop a new scheme for minimizing subendocardial dark-rim image artifacts in cardiac perfusion MRI by optimizing the underlying point spread function (PSF) for radially sampled MRI to eliminate Gibbs ringing effects.